Is your window a pane in the glass? 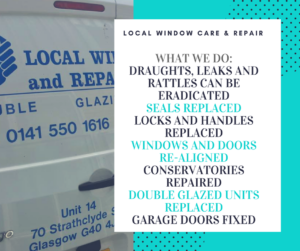 As our name suggests Local Window Care and Repair specialise in the repair and maintenance of PVCu, wooden and Aluminium double glazed windows. We also carry out repairs to residential doors, patio doors, garage doors and conservatories to both the domestic and public sector markets throughout Scotland. What makes us special is we have local offices throughout Scotland which means we can get to you as quickly and efficiently as possible. Our engineers are local to you meaning that we can keep costs low and give you the best solution to your double glazing repairs. As you may be aware double glazed windows and doors incorporate complicated and varied mechanisms and require specialist engineers. Local Window Care and Repair have a wealth of experience in all aspects of the double glazing industry. Here at Local Window Care and Repair we employ engineers who can carry out such repairs to a wide range of different window and door types, saving you the great expense of replacing faulty windows, doors or conservatories. 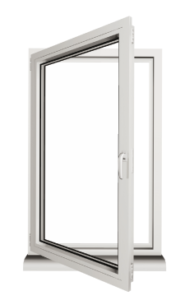 Tilt and turn windows can be adjusted to work as when they were new. Failed and broken gearing and handles can be replaced. Sliding sash PVCu windows, we can also replace spiral balances, handles, locks seals. Likewise for outward opening and top swung reversible windows – new hinges, new handles and new espagnulette locks can all be replaced. Misted or broken double glazed units can be replaced at a fraction of the cost of replacement windows. As a testament to our health and safety practices, we are members of Construction Line and the UK Register of Prequalified Construction Service. In fact any window/door/patio door/conservatory/garage door, any style, we can help – if we can’t fix it then nobody can! So before you commit to replacing your existing double glazed windows call us for a free no obligation quote for repairs no matter how small.